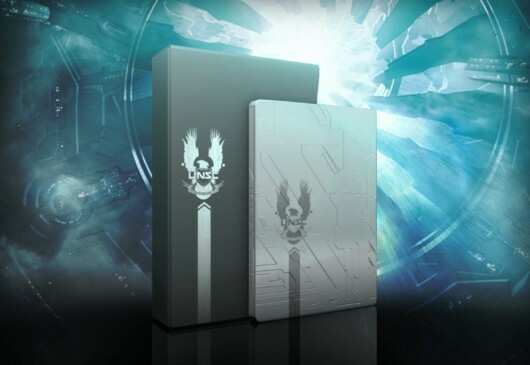 Time to get yourself some bragging rights with the “Halo 4 limited edition” official website has announced a detailed content lists of what you will be having with the pre-order of your copy, the $99.99 price tag features enough content to entice you. The digital bonus content contains unique in-game Spartan-IV armor skin, weapon skin for the Assault Rifle, an exclusive in-game emblem, Xbox LIVE Avatar prop, and Xbox LIVE Avatar Spartan IV armor set. The Briefing Packet includes information about UNSC weapons, an introduction to the massive UNSC infinity ship, a Spartan armor customization schematic, and insight into what it means to be one of humanity’s finest warriors: The Spartan-IVs. Another goodie packed in limited edition is the ability to unlock six Specializations early, available at launch on Xbox LIVE. Specializations unlock new customization options, you can use these six specializations to achieve higher ranks in your Spartan career. A 90 minute extended version of the live-action digital series which will take fans to the terrifying beginning of the Human/Covenant war flashback, when the Master Chief inspired a young cadet who would eventually become a leader aboard the UNSC’s greatest vessel ever: the UNSC Infinity. The Limited Edition includes competitive multiplayer modes better known as War Games and access to nine maps including three future competitive multiplayer map packs, each including three locations, available for download post-launch on Xbox LIVE. Limited edition owners will get nine maps in the form of future DLC with the purchase.